Festival Open Ząbkowska. Photo by Katarzyna Laskowiecka. During the nearly 70 years of its existence, Powszechny Theatre has become one of the most important venues in Polish theatre. A public institution that’s owned and managed by the municipality of Warsaw, the theatre has been under the direction of Paweł Łysak (Director) and Paweł Sztarbowski (Deputy Director) since 2014. 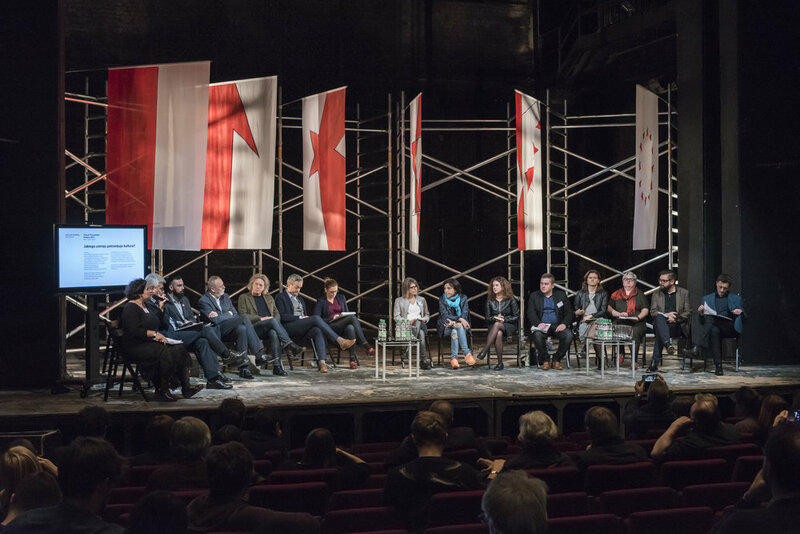 Under their leadership, the theatre has consciously repositioned itself within the social fabric of the direct neighbourhood (Praga district) as well as within the city of Warsaw, pushing the boundaries of institutional theatre structures. The theatre is located on the outskirts of Warsaw, in a district that was long considered to be unsafe and rundown. Today it is one of the most diverse districts of the city due to an influx of newcomers. For a long time, Powszechny Theatre had been disconnected from its locality, but in the past few years, much more effort has been put into revitalising the district by connecting with local residents and supporting local civil initiatives. Collaboration, civic participation, freedom and democracy are the driving values behind a summer festival they organise, called the Happy City Art and Community Festival. It aims to provide a new model for dialogue between artists and local communities. The space in front of the theatre (originally a car park) has been transformed into a small community garden, a place for discussion, exchange of knowledge and skills and relaxation. The theatre’s self-adopted motto is “the theatre that gets in the way”. It strives to create a place that is open to everyone, a place that promotes diversity, supports social engagement and civic commitment – empowering the audience to discuss controversial issues and redefining the role of public cultural institutions. Each season is planned around a specific thematic focus – such as re-emerging fundamentalism, class division, fragmentation and the crisis of democracy. This allows for broader discussion and cross-sectoral collaborations with experts from various fields, with other institutions, and most crucially of all, with the audience. Powszechny Garden. Photo by Katarzyna Laskowiecka. Powszechny Theatre has assumed the role of critical, socially-engaged theatre. It doesn’t shy away from tackling divisive topics, risking sharp confrontation with its audience. A good illustration is the recent landmark production of Klątwa (The Curse) – staged by Croatian Director Oliver Frljić. This took a controversial look at the relationship between the Polish Catholic church and the state, condemning the authorities’ failure to respond to allegations of child abuse by members of the clergy. The premiere in early 2017 was met with huge waves of public protests and clashes. Government officials and religious nationalist groups cited blasphemy and hate speech and an ex-officio investigation was launched by the Prosecutor’s Office. Members of the public and artists, on the other hand, responded with an outpouring support. Following the 2015 elections, the conservative and pro-Catholic government embarked on a mission to transform Polish cultural life to reflect the patriotic and Christian values rooted in the notion of traditional heteronormative family. In response to growing political and financial pressures, critical voices across the cultural and civic sector have been mobilising and cultivating social engagement through culture and free and critical arts. New social movements are flourishing; artists are self-organising in guilds; trade unions are meeting to discuss tactics to counter the transformation of the cultural field. Powszechny Theatre has been at the heart of these efforts. Forum for the Future of Culture. Photo by Arek Drygas. It organises and hosts the annual Forum for the Future of Culture, in partnership with the Municipality of Warsaw, ECF Connected Action for the Commons programme hub Krytyka Polityczna and others. The forum brings together representatives of other Warsaw-based cultural institutions, universities, media and citizens’ collectives, and social movements, united by their fear for the state of democracy in Poland. By planting the seeds for cross-sectoral collaboration among cultural and civil society stakeholders, the theatre aims to promote a new, critical vision of culture, diversity and openness. Through its efforts, it has become a real forum for social change.